By 2030, more than 30 million Americans could have diabetes--71% higher than in 2000. 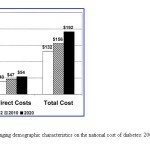 Silver BookBy 2030, more than 30 million Americans could have diabetes–71% higher than in 2000. By 2030, more than 30 million Americans could have diabetes–71% higher than in 2000.